The year 2017 has been incredibly positive for most cryptocurrency exchanges. All platforms saw their user base grow, which is always a positive outcome. At the same time, it also means these companies need to start upgrading their infrastructure sooner or later. Otherwise, they will suffer from degraded services, such as Kraken and Coinbase. 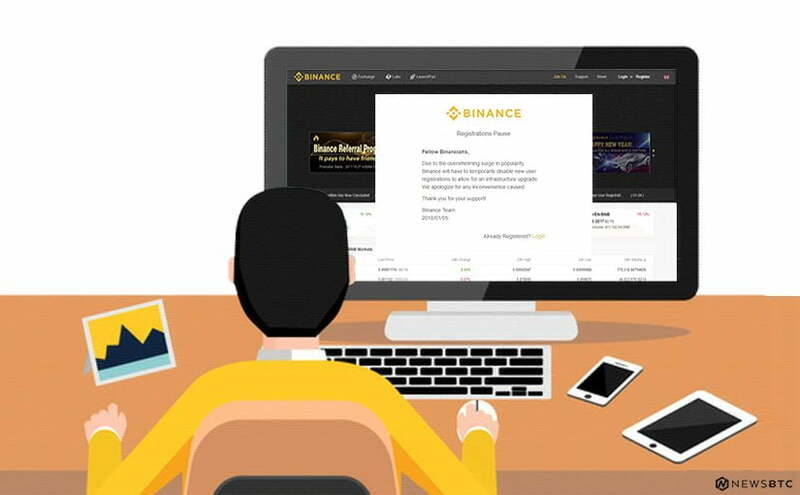 Binance is halting new user registrations due to the overwhelming influx of new traders. In a way, it is good to see exchanges halt new user registrations ahead of time. More specifically, if the infrastructure gets taxed too much, things will deteriorate pretty quickly. Companies such as Kraken and Coinbase know all too well how things can get out of hand. Binance wants to remain ahead of the curve at all times. To do so, they are not accepting any new users until an internal upgrade has been completed. A smart decision by the company, as it will avoid unnecessary friction. While this is not a popular decision, it does make a lot of sense.All services will remain operational for the time being. New users will simply have to wait until the infrastructure upgrade is complete. For now, we don’t know how long this will take, though. The popularity of Binance should not be underestimated by any means. It has quickly become one of the hottest altcoin exchanges in the world. That popularity will only increase further if they continue to provide an optimal service. If Coinmarketcap is to be believed, Binance is the biggest cryptocurrency trading platform in the world. Their daily volume has surpassed $2.5bn, which is rather impressive. It simply makes sense to implement the necessary upgrades at such a critical time. After all, if the company were to suffer from issues, their reputation would take a major hit. It’s always best to scale well in advance, rather than wait for problems to arise. There is still a growing demand for cryptocurrencies, that much is rather evident. Such rapid growth in the world of cryptocurrency is rather unprecedented. After all, things were trucking along nicely until mid-2017. Ever since it feels as if we are in a new gold rush era. Everyone wants to sue exchanges and buy cryptocurrency. A positive development, assuming companies can scale quickly enough. Whether or not Binance will be successful in doing so, remains to be determined. Their course of action certainly hints at a positive future in this regard.